This week marks the publication of an ambitious new book with the audacious goal of showing how to reverse the warming of the planet through a myriad of innovations, many of them led by business for profit. Two and a half years ago, as the project got under way, I provided some context for Project Drawdown, the nonprofit created by Hawken to produce the book. While its roots date to the early 2000s, the project’s inspiration came in large measure from a 2012 Rolling Stone article by activist Bill McKibben, “Global Warming’s Terrifying New Math” — “three simple numbers that add up to global catastrophe,” as McKibben put it. His article offered a sobering arithmetical analysis underscoring “our almost-but-not-quite-finally hopeless” global predicament. That article led Hawken to ask, “Why aren’t we doing the math on the solutions?” as he told me in 2014. The new book aims to do just that: provide the metrics for the solutions needed to solve the climate crisis. The 80 solutions that make up the bulk of the book are grouped into seven buckets: energy; food; women and girls; building and cities; land use; transport; and materials. To qualify for inclusion, a solution must have proven to reduce energy use through efficiency, material reduction or resource productivity; replace existing energy sources with renewable energy; or sequester carbon in soils, plants or kelp through regenerative farming, grazing, ocean and forest practices. Each solution is ranked by cost-effectiveness, speed to implementation and societal benefit. Also included for each is its projected savings in greenhouse gas emissions by 2050, and the solution’s total financial cost — the amount of money needed to purchase, install and operate it over 30 years — and its net cost or benefit — how much money would be required to implement the solution compared to the cost of repeating business as usual. “Drawdown’s” aggregate bottom line is shockingly affordable: When you total up the net first costs and subtract the net operating costs for all 80 solutions, the net operating savings add up to $74 trillion over 30 years. Consider refrigerant management, the book’s No. 1 solution. Hydrofluorocarbons, or HFCs — the chemicals used in refrigerators, supermarket cold cases and air conditioning systems — have up to 9,000 times greater greenhouse gas warming potential per molecule than carbon dioxide, depending on their exact chemical composition. Ironically, these chemicals were tapped in the 1990s to replace chlorofluorocarbons, which were found to deplete the planet’s protective ozone layer. Last fall, a global deal was forged by nearly 200 countries to phase out HFCs by the late 2020s, but the chemicals will persist in kitchens and condensing unit for decades. Ninety percent of their climate emissions happen when fridges and AC units are disposed of at the end of their useful lives. The book models the adoption of practices to avoid leaks from refrigerants and destroy them at end of life. Over 30 years, it calculates that 87 percent of refrigerants can be contained, avoiding emissions equivalent to 89.7 gigatons of carbon dioxide. That’s a far cry from the No. 2 solution, onshore wind energy, not exactly a new technology, but one ripe for scaling; it already is cost-competitive with fossil-fuel energy in some areas, and continued cost reductions soon will make wind the least expensive source of installed electricity capacity. “Drawdown” calculates that an increase in onshore wind from 2.9 percent of world electricity use to 21.6 percent could reduce emissions by 84.6 gigatons of carbon dioxide and create a net savings of $7.4 trillion from business as usual by 2050. Adding offshore wind energy could save 14.1 more gigatons of greenhouse gases and generate $275 billion in additional net savings. In the run-up to the book’s official launch, I recently asked Hawken how the solutions presented in “Drawdown” differ from what he and his team expected to find. I asked Hawken to reflect on what had changed during the roughly three years between the project’s launch and the book’s publication. With world population mushrooming to a projected 9.7 billion by mid-century, food production will need to rise, said the authors, alongside reduced food waste and dietary shifts. Growing more food on the same amount of land cannot be done without attending to smallholders, many of whom are women, whose farming needs have been much overlooked. “Drawdown” models reduced emissions from avoided deforestation that come from increasing the yield of women smallholders by 26 percent per plot, which can happen “if women’s access to finance and resources comes closer to parity with men’s.” That could yield a 2.1 gigaton drop in CO2 emissions by 2050 at a net savings of $87.6 billion. And then there’s family planning, a “third rail” politically, although a fast track to climate resilience, according to “Drawdown.” It modeled how much energy, building space, food, waste and transportation would be used in a world with little to no investment in family planning, compared to one in which the projection of 9.7 billion is realized, which will require increased adoption of reproductive healthcare and family planning, according to the United Nations. The answer: nearly 60 gigatons by 2050, equivalent to about nine years of current U.S. greenhouse gas emissions, based on 2015 levels. Educating girls is yet another promising solution, because education correlates to higher wages and greater upward mobility, contributing to economic growth. When girls attend school, their rates of maternal mortality drop, as do mortality rates of their babies. They are less likely to marry as children or against their will. They have lower incidence of HIV/AIDS and malaria. Their agricultural plots are more productive and their families better nourished. All of which leads to reduced climate impacts. “The resulting emissions reductions could be 123 gigatons of carbon dioxide, at an average annual cost of $10.77 per user in low-income countries.” That yields roughly 60 gigatons of savings by mid-century. When you add up these solutions — educating girls is No. 6 and family planning is No. 7 — empowering girls and women for addressing global warming represents the most impactful tool for achieving drawdown, said Hawken. And then there’s the book’s “coming attractions,” the 20 innovations not yet ready for prime time, but which are poised to play a role in drawdown. They include things already entering the mainstream (autonomous vehicles, smart highways, industrial hemp) and others that are a bit more out there (marine permaculture, artificial leaves, skyscrapers made of wood). Their potential to reverse global warming isn’t calculated in the book, but their presence makes it clear that our capacity to solve global warming doesn’t rely solely on what we already know and do, and that innovations will continue coming. The ultimate test of “Drawdown,” of course, is what impact it will have on companies, policymakers, activists, entrepreneurs and the many other players concerned about or working on climate issues. The book’s tentacles extend to nearly every business sector, culture, ecosystem and social structure — not to mention the everyday shopping, eating, energy, transportation and waste-management practices of the entire human species. In that regard, the book represents a kind of operating manual to life in the 21st century as it relates to a warming planet. Its vast scope is both breathtaking and, at times, overwhelming. 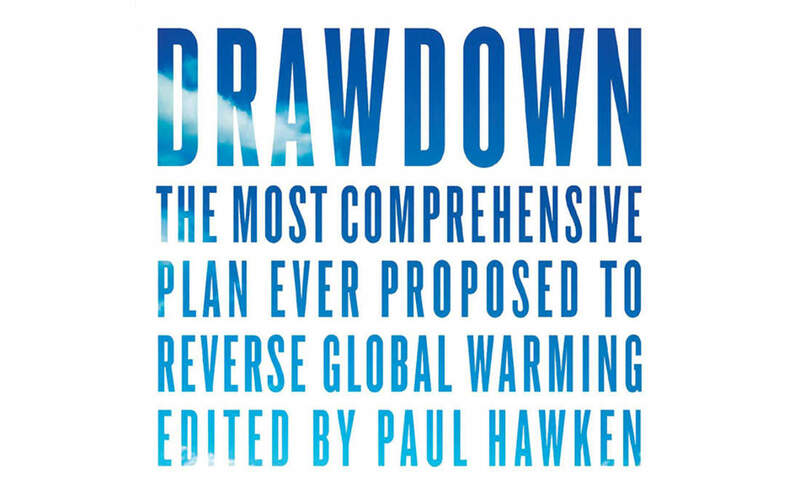 Hawken and the “Drawdown” community view the book as the first step in a larger effort to leverage their research and data to effect such systemic change. There’s a Facebook campaign already underway, a possible TV series and plans for a sequel — “D2,” as it’s being called internally. The data sets behind the book are being made available to researchers and others who want to build on or adapt them locally. But meanwhile, there’s a book to sell, here and now. In our recent conversation, I asked Hawken how he would measure the book’s success over the next few years. Equally important, said Hawken, is to change the conversation about climate so that it’s inclusive and understandable. Hawken believes the private sector could take the lead on this — not just in their products and services or investments, “but also on the moral level, on the CEO level, on a board level,” said Hawken.